Edition 9 of the Walks Around Britain podcast features a walk around The Chines of Bournemouth with writer and blogger Karen Guttridge, we preview the new Buxton Adventure Festival and the Hay Walking Festival - both happening in October - and the co-founder of Rohan, Sarah Howcroft talks about Recycle Outdoor Gear. Karen Guttridge is a writer and blogger and her travels can be found on her blog as well as her Facebook page and Twitter stream. The walk Karen embarked on for our podcast is a great one for families - and you can see photos of it on Karen's Flickr stream here. Lissa Cook talked about the first Buxton Adventure Festival, taking place on the 20th and 21st October in the Peak District town. An unmissable weekend of guest speakers & featured films for adventurous spirits and minds at the Pavilion Arts Centre, Buxton Opera House. To find out about the speakers and the films in the programme visit the Festival's website. To complement the Festival, the tourist board Visit Peak District & Derbyshire are launching a new Walk & Watch Festival with a dozen guided walks across the Peak District. Anna Heywood from Drover Holidays and Trisha Doree from the Brecon Beacons National Park joined Andrew to talk about the second year of the Hay Walking Festival. 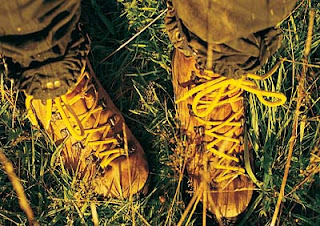 The walk organisers and team have assembled a full walks and events for our second anual walking festival to take place in October 2012. A programme of over 50 guided walks is planned, for all ages and abilities, from full days to a few hours, together with some walks of special interest such as foraging and geocaching. Some of the walks have already sold out, so a visit to the Hay Walking Festival website to book soon would be a good idea. Not content in co-founding Rohan some 40 years ago, Sarah Howcroft launched earlier this year Recycle Outdoor Gear (ROG) - the UK’s first free of charge online service dedicated to helping everyone find a solution to the endless amounts of gently used and unwanted outdoor clothing & equipment taking up space in cupboards, lofts and garages. Most preloved gently used outdoor clothing and equipment has reuse or second life potential if only you could get the word out. Now you can! To find out more, visit the Recycle Outdoor Gear website. Gift Your Gear - the project supported by Rohan in their 60 stores throughout the UK - is only supposed to be during September, so we'll let you know if it is continuing - watch this space. That's another podcast finished - we do hope you are enjoying them, Remember you can also find them on iTunes, on AudioBoo, on our YouTube channel and on our website. Please let us know what you think about our podcasts - what do you like, and what would you like to hear? Leave us a comment below, or send us a voice message on our blog.